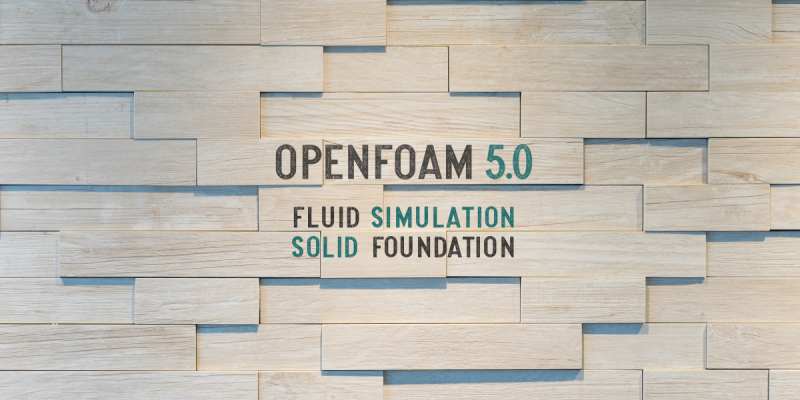 The OpenFOAM Foundation is pleased to announce the release of version 5.0 of the OpenFOAM open source CFD toolbox. Version 5.0 is a snapshot of the OpenFOAM development version that is “always-releasable” quality, through rapid-turnaround feedback between code maintainers and users. It provides new functionality and major improvements to existing code, with strict demands on usability, reliability and maintainability. It is produced for the benefit of all users, rather than a handful of commercial organisations. New functionality includes wave modelling, parallel I/O and a rewrite of the tracking algorithm. Usability of snappyHexMesh has improved and new functionality in blockMesh enables background mesh generation that has improved reliability of rotating geometry cases. There is new modelling in transport, turbulence, thermodynamics and combustion and useful new generic tools, e.g. more user-defined functions (Function1) for time-varying boundary conditions. There are improvements in performance and reliability of numerics, e.g. for multiphase and compressible flows, and general usability, e.g. bash completion, new function objects and the latest ParaView 5.4.0. Version 5.0 is a new major version release in which some backward compatibility to OpenFOAM version 4 is not maintained (requiring some changes to case input files), containing 816 code commits since version 4.0. OpenFOAM 5.0 uses all features of the ISO/IEC 14882:2011 (C++11) standard, and has been tested with C++ compilers that conform to that standard, such as GCC v4.8+, Clang v3.7+ and Intel ICC v17.0.4+. macOS: installation with a Docker container. Further Information: “Water Waves in OpenFOAM”. Further Information: “OpenFOAM Barycentric Tracking”. Data Visualisation: updated the native OpenFOAM reader module for ParaView version 5.4.0 [ commit 68089 ]; maintenance of the native reader module ensures continued trouble-free visualisation of OpenFOAM data. Maintenance/Testing/Contributions: Henry Weller, Chris Greenshields, Will Bainbridge, Mattijs Janssens, Bruno Santos. Thanks to the OpenFOAM enthusiasts who have contributed to a better code through the Issue Tracking System. To download OpenFOAM 5.0, click here.